Rules of the Game: This is how the game works. We will pick every game each week (outside of the Thursday night games or dare I say Wednesday night games). Whomever gets the most cumulative games right at the end of the regular season wins. No spreads. Just straight up pick’ems for the most parity filled professional sports league in America. The Word: Will Andrew Luck have “luck” on his side in his NFL regular season debut at Soldier Field? The Word: The once self-proclaimed “Dream Team” looks to begin the dynasty (Michael Vick’s words) in LeBron’s old stomping grounds against rookie quarterback Brandon Weeden and the Cleveland Browns. The Word: Expect some fireworks at LP Field. Unfortunately, they won’t be of the positive variety for the home team. The Word: Julio Jones has made it clear that secondaries are going to struggle containing the Falcons outstanding receiving group. Will he put his money where his mouth is against one of the better secondaries in football? The Word: Both Blaine Gabbert and Christian Ponder are praying for much stronger sophomore campaigns. So are their teams. The Word: RGIII’s much-anticipated NFL debut against the team that ate up most of the off-season headlines. How will the NFL’s first interim-to-the interim coach and his team respond in front of what will likely be an electric home crowd? The Word: The New York Tebows are praying that the preseason will be nothing like the regular season. Buffalo and their revamped defensive unit are being picked by some to be a surprise playoff team. The Word: After making the playoffs for the first time since 1999, the Lions hope the 2012 season will have some major similarities to the 2011 season. St. Louis on the other hand is praying 2012 is much different than 2011 was. The Word: Hard Knocks confirmed something that everyone already knew. The Miami Dolphins are in for a very long season. Plus, Houston will be one of the elite teams in football this year. The Word: NFC Championship Game anyone? Think about it. The Word: Russell Wilson versus John Skelton. Who saw this coming a month ago? The Word: There are very high expectations in Carolina. The situation is similar to the one Tampa Bay found themselves in heading into the 2011 season. Hopefully things work out better for Cam Newton and Co. then they did for the Buccaneers. The Word: A long-awaited rematch of last year’s AFC wild-card round overtime thriller. Also, Tim Tebow is gone, but a guy named Peyton Manning returns to the field for his first real game in 610 days. The Word: One of the best developing rivalries in football that nobody knows about. Also, RIP to the great Art Modell. The Word: Carson Palmer and Philip Rivers are both hoping to atone for disappointing 2011 seasons. Getting off to a good start in the opener would help. I will admit that it is hard to overlook the San Francisco/Green Bay matchup. But this game not only is between two major AFC contenders, but these are divisional foes, and rivals. During Week 1 last season, the Steelers and Ravens got the AFC North party started. Well let the AFC North slugfest begin. Baltimore is looking to become the first team to repeat as AFC North champs since 2008, while Cincinnati is looking to prove that 2011 was no fluke. The Bengals and Ravens have met six times over the past three years. Baltimore has won the last three matchups, while the Bengals won the previous three before that. Could this be turning into a rivalry of threes? If so, it may be a good year for the Bengals in terms of this budding rivalry. BD: My weekly column will be dedicated to those that are searching for that line in Vegas that doesn’t make sense or that underdog team that is poised to take a bite at competitors that are receiving more attention or praise from past performances. The story of the preseason has undoubtedly been the rise of one Russell Wilson in Seattle. Wilson will be making his rookie debut on the road against a top ten blitzing defense in Arizona. Rob Horton (Arizona’s D-coordinator) is not going to give vanilla, Big Ten blitzing schemes against Russell Wilson, and I see him struggling seeing his first real NFL experience. Add a banged up Marshawn Lynch to the equation, and Seattle may be in for a rough day. On the other side of the fence sits John Skelton, who just beat out Kevin Kolb for the starting position in Arizona. John Skelton has not made any news despite going 7-1 in his last 8 games started for the Arizona Cardinals. Larry Fitzgerald, the biggest difference maker on both teams, also went over 100 yards in four of the eight games that Skelton started in last season. CB: Big week of games to start off the year! Most interesting game this week to me is the Steelers at Broncos. 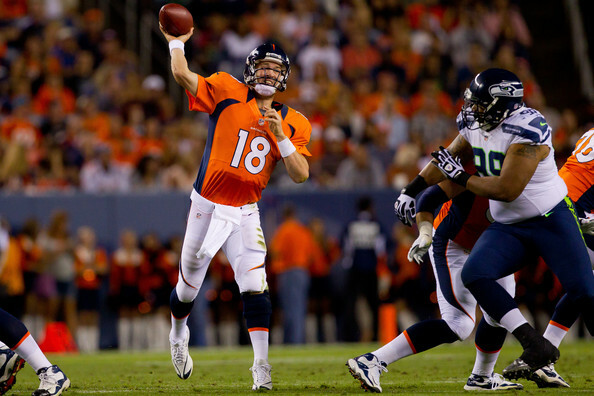 Peyton Manning is back and looks to be on his way to another great season. This game will give us a look at how the new Broncos offense will go up against that ferocious Steelers defense. I look for Peyton to start out the season 1-0. CV3: Who will establish dominance right away in the 2012 season? May not be the teams we are used to seeing dominate the rest of the league. There are a lot of questions entering this season; how will the Saints perform without their fearless leader? Will Peyton restore Denver to glory? What the heck is going on with the J-E-T-S? Is the Baltimore D too old? How will the rookie QBs perform? ….. We may have some of those answers after Monday night when teams are done making their first impression. Also, we are sure to hear about mistakes from the officials that may be deciding factors in games this weekend. With so much up in the air, it should make for an exciting opening weekend for the NFL. The air does seem a little strange in Cincinnati though. For the first time in a very long time, we have early season hopes for the Bengals, while a Reds team is contending for the best record in baseball. I could get used to this! Have a happy NFL weekend and may your fantasy teams not be screwed with a season ending injury! TSK: Start your engines. Week 1 in the NFL is nothing like the opening week in college football. There are loads of big-time showdowns from the get-go. Obviously, many will be focusing heavily on Peyton Manning’s debut in a Broncos uniform against the always dangerous Pittsburgh Steelers. But there are plenty of other items to note. Five rookie quarterbacks will be making their NFL debuts. Tim Tebow will be playing in his first official game as a member of the New York Jets. Brandon Marshall will take the field for the Chicago Bears. And so much more. Week 1 will be a ton of fun. This entry was posted in NFL and tagged AFC, Andrew Luck, Arizona Cardinals, Art Modell, Atlanta Falcons, Baltimore Ravens, Blaine Gabbert, Brandon Marshall, Buffalo Bills, Cam Newton, Carolina Panthers, Carson Palmer, Chicago Bears, Christian Ponder, Cincinnati Bengals, Cleveland Browns, Dallas Cowboys, Denver Broncos, Detroit Lions, Green Bay Packers, Houston Texans, Indianapolis Colts, Jacksonville Jaguars, John Skelton, Julio Jones, Kansas City Chiefs, Kevin Kolb, Larry Fitzgerald, Marshawn Lynch, Miami Dolphins, Minnesota Vikings, New England Patriots, New Orlean's Saints, New York Giants, New York Jets, NFC, NFL, Oakland Raiders, Peyton Manning, Philadelphia Eagles, Philip Rivers, Pittsburgh Steelers, Rob Horton, Robert Griffin III, Russell Wilson, San Diego Chargers, San Francisco 49ers, Seattle Seahawks, St. Louis Rams, Tampa Bay Buccaneers, Tennessee Titans, Tim Tebow, Washington Redskins. Bookmark the permalink.